HP is turning into a problem. 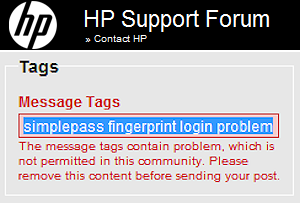 Apparently HP disallows tagging any forum post to their Support Forum as a “problem”. Right, because then they would rule their own search results for “HP problem” with useful discussion threads. I recently bought a HP Pavillion dv6t laptop, only to return it after a few days — I’d press the power button to turn it on & it would cycle off & on 10-15 times before eventually deciding to stay on for good. HP tech support took 6 solid hours on the phone to cheerfully wade through their pre-exchange process in a futile attempt to fix an obvious hardware power problem (doing things like a full-system virus scan) … but they finally accepted it back. Whiirrrrrrrr…. silence. Whirrrrrrrr…. silence. Whirrr….. silence. The cooling fan would cycle on & off every ~30 seconds. It would turn on with a loud whir, then slowly decrease speed down to near-silent, then shut off for 10 seconds, & start the whole thing over. Pretty freaking annoying. Granted it was marginally better than the power cycling issue with my first Pavillion dv6t, but this was the CPU fan equivalent of Chinese water torture. I checked the System Resource monitor, no CPU or disk usage spikes. Tried rebooting, no difference. Tried it plugged in & on battery … Changed power settings around … Cursed HP & threatened to exchange it yet again. Nothing. The only improvement was when the processor was under load — the fan stayed on a little longer between its spastic cycling. I found a “Fan Always On” setting enabled in the BIOS (which clearly wasn’t working) & tried switching it to “Disabled”. It made the pause between the fan cycling only slightly longer. Someone at HP has an evil sense of humor. 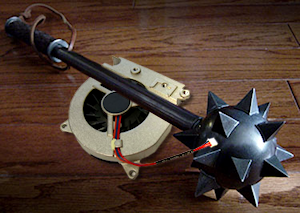 At this point I got my CPU fan mace off the shelf & started practicing. As a last resort, I tried a BIOS update, although HP’s BIOS update changelog didn’t mention any cooling management improvements. But, it COMPLETELY FIXED the fan cycling problem. Unfortunately I didn’t write down what BIOS version with apparently defective fan management I started out with, but regardless, the most recent BIOS update from the HP website fixed the issue. UPDATE: I’m sorry to report that the BIOS update only partially fixed the fan problem. It’s not occurring as frequently now as before the BIOS update, but still pretty annoying. Now the fan cycling happens occasionally for 5-10 minutes whenever I use the laptop on battery power. It’s not because the fan vent is blocked — I have the 9-cell battery that creates about an inch of space under the back edge.